On-boarding new talent can sometimes be a daunting and stressful task. This is especially true during a skilled labor shortage like the one that exists today. 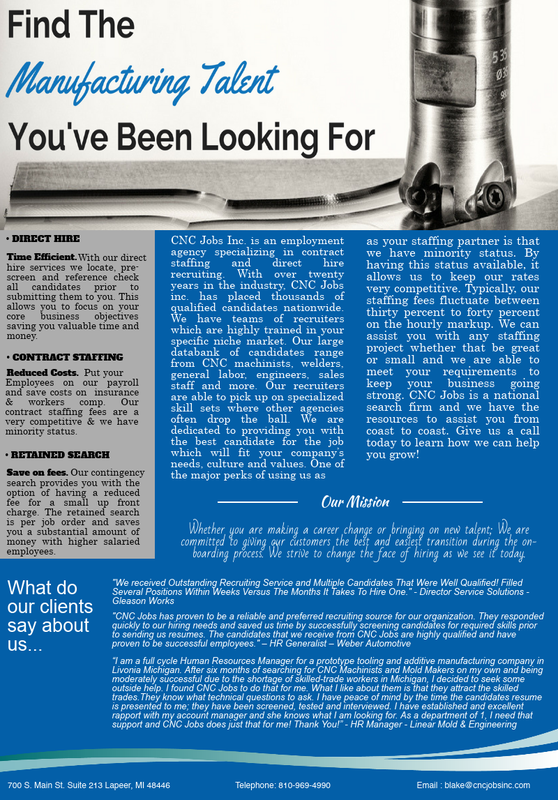 For this reason, many companies choose to CNC Jobs Inc. as their exclusive staffing partner to help them with those hard to fill vacancies. Due to us being a minority supplier, we are able to offer some of the lowest staffing rates in the industry. We also provide great benefits to our contract employees, WC insurance, payroll & more! Visit our benefits page for further details. Our recruiters specialize in your industry and we utilize our network, technology & proven recruiting strategies to find the best talent available. Below is a brief overview of our services. If you would like further information please feel free to contact us on our "contact us" page.